Hanoi is one of the most exciting places to visit in Vietnam. As Vietnam's capital, it is best to make Hanoi the centre of your exploring the rest of the country. ​It is best to use it as a base to explore the north of Vietnam including Halong Bay, Ninh Vinh, and Sapa. You can even go on to China. Flights and rides are easily accessible here. The city of Hanoi especially its Old Quarter invites visitors to an exploration adventure that several days will not even finish all of them. ​The Old Quarter was formerly an artisans market with each street devoted to either silk, paper, jewelry, religious items etc. Today, there are still stores that sell similar items in the past but mostly they now cater to the tourists. Still, it is a fun place to explore. The Old Quarter was formerly an artisans market with each street devoted to either silk, paper, jewelry, religious items etc. Today, some streets have maintained stores that sell these items but mostly they now cater to the tourists. Still, it is a fun place to explore. When you have had enough of the crowd and traffic, head to Hoan Kiem Lake and just enjoy the serenity of the place. The selection of interesting street food are varied and one can sample these easily in many of its streets. Try some of the famous dishes such as Pho Bo, Bun Cha or Cha Ca La Vong. ​The museums display for the country the best of its history, artefacts, art, and culture. Fees are cheap and many are easy to walk to from the centre of the city. Hanoi is best explored on foot so it is advisable to get a hotel close to the centre, preferably, within the Old Quarter or close to Hoan Kiem Lake. Taxis are cheap and readily available. You can always hail one wherever you are except on weekends when some streets are closed off to vehicle traffic. ​It is best to start your visit with the Ho Chi Minh Mausoleum as it is only open in the morning. This shrine is a sacred place for the Vietnamese so dress appropriately, tops with sleeves and pants or skirts to cover your knees. If there is a problem with clothing, not to worry. They have some for sale outside the mausoleum. The Mausoleum houses the remains of Ho Chi Minh, the country's beloved leader. It was here that he presented in 1945 the Declaration of Independence of the Republic of Viet Nam. ​On the side is the Governor's Palace, the huge yellow building, the residence of the head of the French colonial rule in Vietnam. Behind it is Ho Chi Minh's house on stilts and made of teak. It is worth a visit to have a sense of the greatness of this leader that propelled a victory for Vietnam. ​You can walk on to the One Pillar Pagoda. Enjoy the legend of the place, light an incense, or just enjoy watching the locals do so. From here, go to the Old Quarter and enjoy Hanoi street food for lunch. Try bun cha or pho bo. Or, go to Van Mieu or the Temple of Literature and just enjoy the garden first before exploring the temple. Temple of Literature in Hanoi. 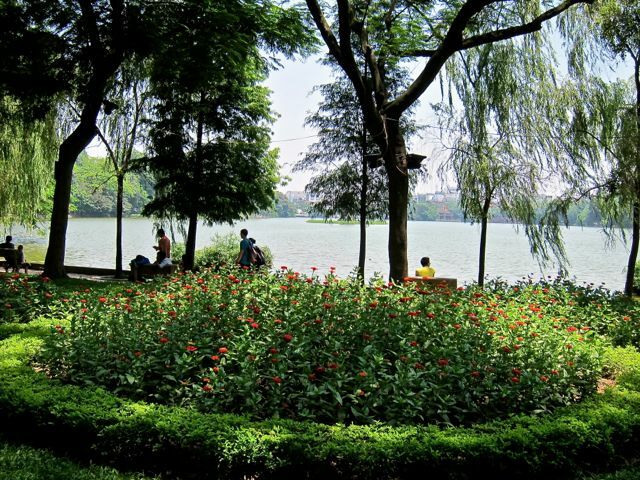 ​When you have had enough of the crowd and traffic, head to Hoan Kiem Lake and just enjoy the serenity of the place. Schedule a weekend in Hanoi. The downtown streets are closed off to vehicle traffic. You can freely walk the streets undaunted by traffic and enjoy the local bands, families playing board games on the road, food trucks, cafes, and join in. In the evening, other streets are closed off to vehicle traffic and there are again bands, tables and stools on the road. Locals and tourists enjoy the road barbecues and cheap beer with promotions from companies like Tuborg, Tiger and Bia Hoi. ​Ta Hien and MaMay: Food Streets in Hanoi. This time, we are staying for 2 months and although I had been here many times before, there are still so many places to explore and enjoy in this city. ​Have you been to Hanoi? What did you enjoy most of the city?